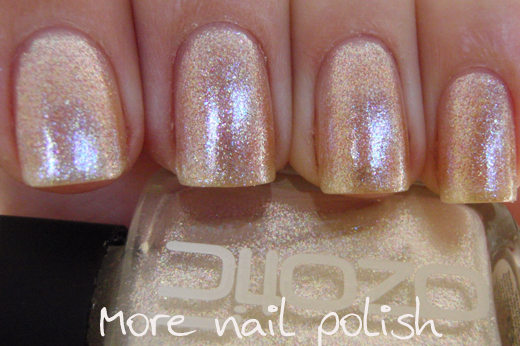 The next four blog posts I have for you tonight are the four Ozotic 'Beam' polishes. The Beam range was inspired by reflecting luminous light beams and are all moonlight shades with sparks. They are all different combinations of magical shifting glass flecks in the bottle and when layered over black they explode into colourful light beams. 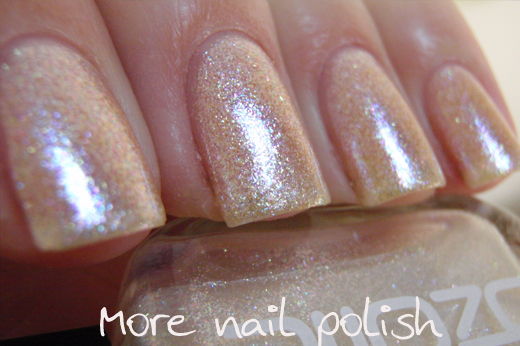 In the bottle Ozotic 905 Beam is white translucent polish with little glass flecks. 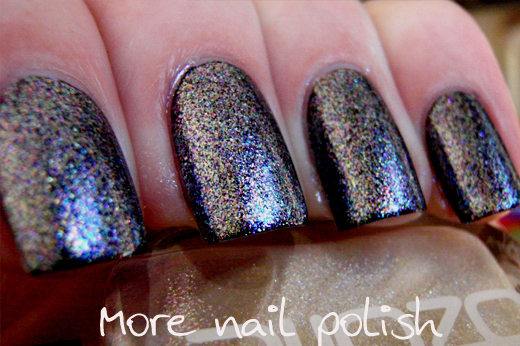 It's very hard to see the multicolours in the bottle, but once you apply them to your nail it's quite an amazing finish. 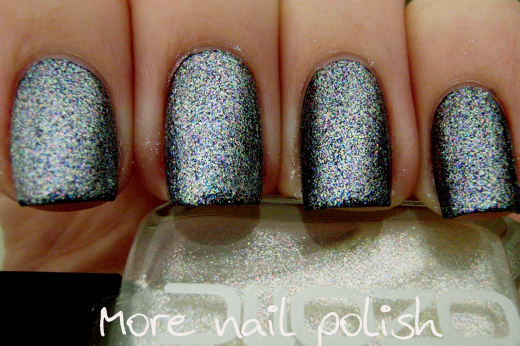 This first photo shows one coat of Ozotic 905 over black. I was careful with my application for one coat, because if you wipe the same spot to many time it will wipe off the glass flecks leaving your polish looking patchy. 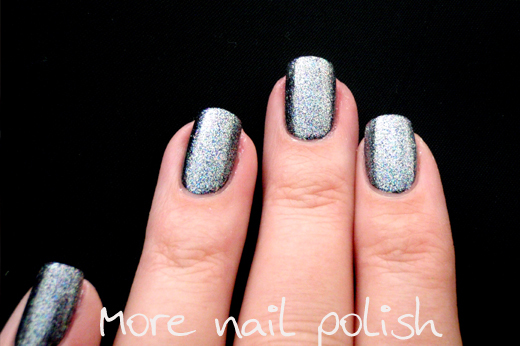 If you want to see the multicoloured flecks the best, you will want to aim for one coat, because at two or more coats the polish looks quite different. 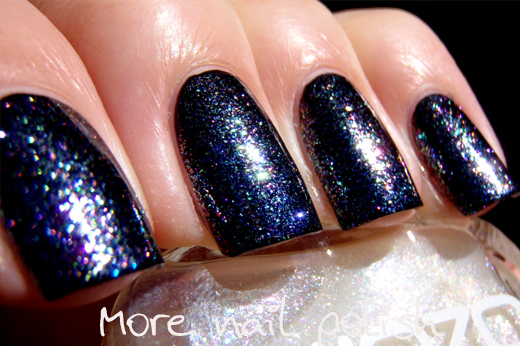 Here is a shot taken in the sun, I wanted to show how reflective these polishes are, and how you can actually see the different rainbow colours light beams reflecting of each coloured particle. The macro shot shows all the micro glass flecks. There is pink, purple, blue, green, yellow and orange/gold. 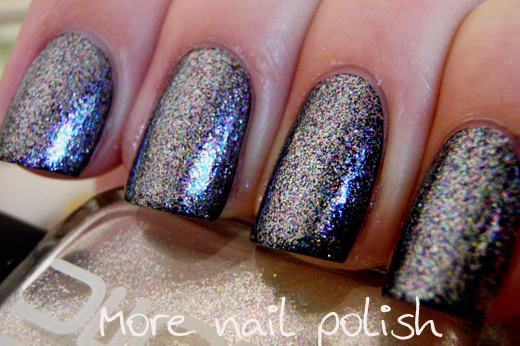 At two coats the polish transforms into a foil like finish and is a very silvery reflective. It actually has a steely grey metallic look about it. I really didn't think I would be able to get the Beam polishes opaque on their own, but I was surprised to find that it was close enough at three thicker coats. It did dry quickly between coats which was good. 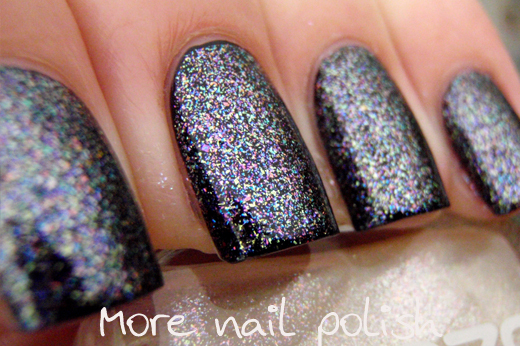 Without the black base this polish has a silver pink tone. 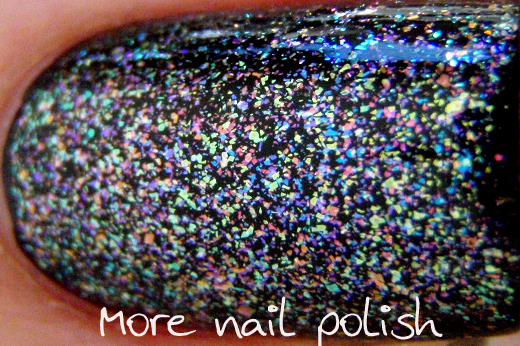 These gorgeous glass flecks look to be the same ones that are in Picture Polish White Wedding and Warning. Having now closely scrutinised five of the shades, I think that all the flecks are duochrome, so while I listed about six colours above, I think there are actually less colours, but they all flip shades. Formula and dry time were both good.